Whether you’re ready for it or not, spooky season is upon us. Maybe you’re still thinking about your costume or what scary snacks you’re going to make for the big night. Well, why not take a break from those things and get your heart racing at an exciting haunted attraction? There’s no shortage of haunted experiences in Arizona and here are some of our favorites. Located in the backyard of a Phoenix residence, this haunted house has been spooking spectators since 2009 with a unique combination of “malevolent clowns, foreboding fortune tellers, wicked games, torturous mazes, and freak show gore.” This year’s theme, Zirkus: The Dark Carnival, promises depraved clowns and a spooktacular sideshow full of freakish feats. If there’s one thing the host of Arizona’s Haunted Graveyard, Chris Burkett, has, it’s experience. This wedding-DJ-turned-horror-master been in the business of scaring folks for three decades. His interactive experience engulfs his entire yard with multimedia displays drawing influence from all over. This year, though, the haunted attraction takes its inspiration from John Carpenter’s character from his Halloween series, Michael Myers. As such, Burkett’s garage and yard will display recreations of popular scenes from the movies—which is a timely choice, given that there’s a new movie coming this year. Brave this six-acre corn maze, and you’re in for one wicked walk. Lurking in the shadows of this scary nighttime attraction are creepy clowns, leather faced weirdos, and bloody beasts, all ready to scare you to your core. This dark, dangerous maze takes approximately 45 minutes to an hour to complete, and you can expect to feel fearful with each step further into the field. Located on an old quarry compound, this haunted theme park features four alarming attractions: Startled Darkness, the witchy Epic Fear that’s crawling with clowns and zombies, Slayer’s Slaughter House, a serial killer’s home, and lastly, Operation Zombie Storm that provides participants with an opportunity to shoot zombies with paintballs while on a wagon ride. Get scared at Scarizona Scaregrounds today! Brought to you by 13th Floor Entertainment, Phoenix’s Fear Farm is arguably the biggest and most bloodcurdling haunted attraction in Arizona. Covering a whopping 27 acres, Fear Farm boasts one horrifyingly haunted hayride and five different alarming attractions—from the Slaughterhouse to Fallout to The Buker: Area X which draws inspiration from 1997’s Phoenix Lights incident. Come for the fun, stay for the fear. Make a night of it at Fear Farm—they dare you! The haunted house now called Yuma Nightmares has a long history. First opening in 2001, with one lone actor, Yuma Nightmares now features not one, but 50 different actors to cover its one-acre premises. The property’s desert-like lot has “over 300 different plants,” which transforms the lot into a “cemetery-like environment” and provides the Yuma Nightmares cast with plenty of places to hide. Be sure to check it out to see how the set design and costumes evolve each year! Tucson’s Slaughter House boasts that it’s “the only haunted house that’s actually haunted.” While we can’t say whether it’s true, its 5 “bone-chilling” attractions certainly are startling. First, there’s the infested Boiler Room, then there’s Cirque du Slay (which you’ll want to stay away from if you have a phobia of clowns, just saying), after which is City Meats—an “extreme haunt” where people can and will physically grab you, a zombie killing adventure called The Apocalypse, and finally, the “demented” Voodoo Bayou. Nightfall is more than just a haunted attraction in Tucson. In fact, it’s an entire haunted town! With five haunted attractions, four live shows, and six spooky amusements, Nightfall provides entertainment for the whole family all night long! Visit this terrifying town to have a frightful evening you’ll never forget. Sanctum of Horror has one simple goal: to scare patrons as much as possible with its two attractions. The “Breach” attraction takes place in a bunker where the military and science experiments have taken over the place. Sirens blare, the noise never stops, and a wild cast of characters jumps out at patrons. Meanwhile, at Sanctum of Horror’s namesake, patrons wander through the home of Lenore, an insane mental patient who escaped from an asylum for a twisted time. 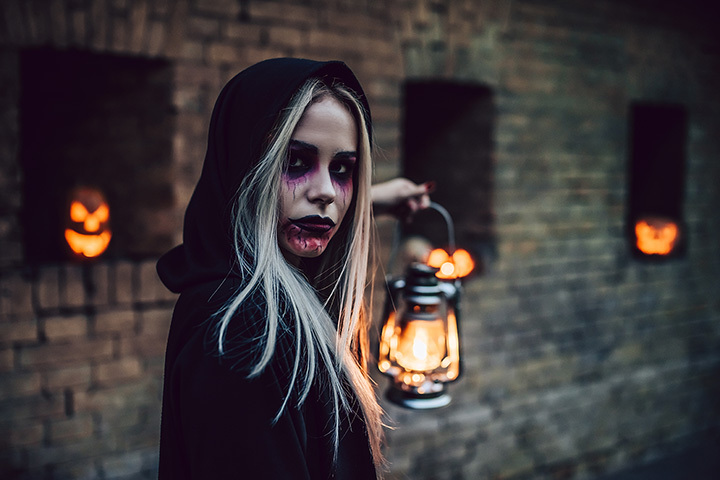 If you’re looking to be scared out of your skin, you’ll want to run right over to Phoenix’s 13th Floor Haunted House, which features two terrifying attractions, each offering its own eerie experience. This year, 13th Floor’s haunt is inspired by the horror film “The Nun,” including, of course, a ghoulish nun—and plenty of other freakish figures. Next door is In the Shadows, a ghost town swarming with tons of virus-infected zombies for patrons to flee from. To move forward, patrons must solve puzzles and push buttons in this terrifying escape room-like adventure.